La Cueva came into existence by joining a ruined house, a very neglected chickenpen and a total ruin. We renovated everything with lots of dedication and love to the detail, trying to incorporate local materials like wood, stone, reeds from the river,esparto (local woven grass) and terracotta. The result is very rustic, with lots of Moorish charme, but at the same time extremely comfortable with all the amenities. Spoil yourself a few days and enjoy life!! 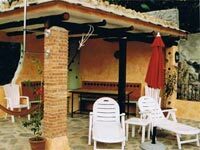 La Cueva is situated in a small, hidden alleyway in a very quiet part of the village. Enjoy the fantastic views of the surrounding mountains, the Guajar valley and across to the Moorish ruins. Start the various hikes directly from your doorstep. Enjoy the typical Andalucian countrylife, totally untouched by tourism! Watch or help the locals peeling the almonds or harvesting the olives, avocados or custardapples. Sit in the local bar and let the rural life go past you! Sit up on the roof terrace with your favorite drink and enjoy the sunset, or the rise of the moon or count the many shooting stars, always with a secret wish, of course. Just lean back, relax and enjoy! La Estrella sleeps 5 people in two bedrooms. One offers a bid bed of 180x190cm and in a little and very cozy sideroom, that can be closed off with a curtain you find another bed of 80x190cm.The other one has a bed of 135x190 cm and leads out to a balcony, that overlooks the patio and the cavepool. They share a very original bathroom, that is accessible from both. We provide bedsheedts and towels, except for pool and beachtowels. In summer there are fans and mosquitonets over all beds, to guarantee a sound sleep. Downstairs are the livingroom, the diningroom and the kitchen, all open plan, all very cozy and comfortable with a rustic atmosphere. All doors, windows and furniture were made by a carpenter and are of a high standart We offer Sat/TV, a radio CD player and for the cooler month a glassfronted woodburner. The kitchen is of course fully equipped.Outside you find a Moorish style patio, with two sittingcorners and a fountain. Some steps lead up to the Jacuzzi-pool, set into a cave, with a waterfall. Quite a setting!! Here there is also another bathroom with shower, toilet and sink, as well as a washinmachine, an iron and ironing board. A spiral staircase leads up to the 100m2 roofterrace with its breathtaking views across the surrounding mountains. There are two shady pergolas with sittingcorners, a BBQ, sunloungers and hammocks. Of course you can rent both houses together (La Estrella and El Sol), which would offer comfortable space for up to 9 people. Guajar Faragüit is the mainvillage of the 3 Guajares and offers a bar/restaurant, a small supermarket, various bakeries, a bank with tellermachine, a farmacy, a doctor etc…Saturday is marketday and nearly every day come by fish, bread, and vegie and fruitsellers.